Microsoft has released SharePoint 2013 and their marketing department is pushing very heavily the message that everything should be an App. With this strong promotion of Apps, many customers, developers and other users start asking, why you don’t build things with Apps. The SharePoint App Model is version 1.0 and as we remember also sandbox solutions where version 1.0 with SharePoint 2010. Those sandbox solutions are 3 years later already deprecated, but on the other hand still widely used by out-of-the-box features. I would guess that Microsoft just changes to non-code, but not removes the sandbox solution model for the next release. If you take a deep look into a SharePoint hosted app package, you will realize that this contains also a wsp file. Even if everyone at Microsoft tries to convince us that the App Model is the thing for the future, I recommend to evaluate carefully if an App is the right thing for you. I don’t want to say that you shouldn’t use apps, but consider carefully if an App is what you are looking for, or if you just plan to build an App because it’s the new buzz word. 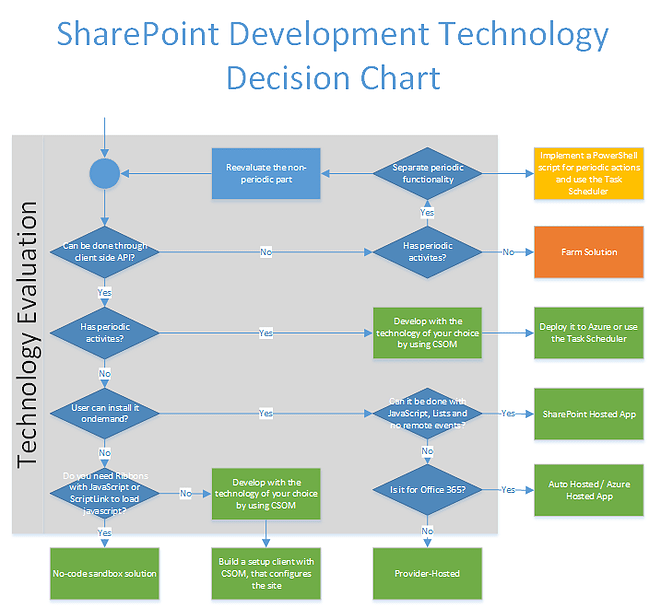 To support developers, architects, consultants and customers, I designed the SharePoint Development Technology Chart. This should help you to make a better decision in choosing the right technology. Please be aware that at end it’s you that makes the decision and you are responsible for it. The decision chart is based on the idea, that you separate each use case and you do an evaluation for each of them. It could be that your solution is a mix of apps, sandbox solutions and a client application used to deploy and configure it. Yellow – Can’t be used with Office 365 multitenant. Could work with Office 365 dedicated (please verify it with Microsoft before starting to build it).